Ah, the decision to choose which book to pimp first for your festive-season consideration was far more difficult than I thought it would be. So many great books, and I’m the worst decision-maker when it comes to selecting which book to read next, let alone which book to pimp next. So, as an Aussie, I’m going to start with an Australian author. You really should be reading Aussie authors – we’re awesome. So, today I’m going to reintroduce you to Melbourne-based author, Jason Franks. Jason is a novelist and comic book/graphic novel author and illustrator, and this year I read his novel Bloody Waters (reviewed here), and the first in the comic series, Left Hand Path (reviewed here). 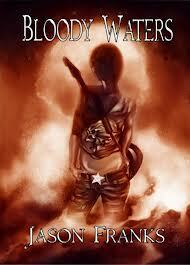 Bloody Waters is an action-packed, supernatural black-comedy that follows the life and times of guitar virtuoso Clarice Marnier. Clarice is a singularly-focused, no-nonsense, quick-witted protagonist you can’t help but love – she does what needs to be done to achieve her goals. I thoroughly enjoyed this book, and recommend it to anyone who has a bent for supernatural horror with more than a sprinkling of dark comedy, witty repartee, and a hell of a twist at the end. I read well into the wee-morning hours to finish this book. Left Hand Path is also quite a dark comic – we’re talking horror here. I picked up my signed copy at Melbourne ComicCon this year, and this is one seriously cool comic, with fantastic (and explicit – yay!) artwork. 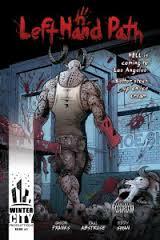 In book one (the only issue out at the moment) we’re introduced to the Unconventional Incidents Unit (UIU), who are called to a bloody massacre perpetrated by a demon that’s now loose on the streets of Los Angeles. Very much looking forward to the next issue. While those are the two books of Franks I’ve read, there’s so much more on offer at his website, including the comic series McBlack (think Noir) and The Sixsmiths ­– a family of suburban Satanists who’ve fallen prey to the recession. What I’ve found with Franks’ work is a delightfully dark satire that makes him stand out from the wonderfully diverse range of books, comics and graphic novels on the market. If you haven’t given his stories a read, then it’s something you really must change. Go. Now. 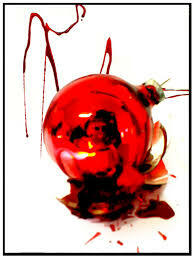 And fill a Christmas stocking with some deliciously dark work. Dare ya. Recommended for horror lovers, comic connoisseurs, adult audience. Nice interesting post, lovely pics. Thanks, Mukul. I’ll be pimping more books as we near Christmas — no better gift is there!